Digital audio workstation (DAW) is an electronic system, primarily designed for recording, editing, and playing back digital audio files. In more recent time, many technological advancements are taking place in audio and video market. Media and entertainment sectors use a wide variety of active digital audio workstations. Thus, digital audio workstations market is expected to witness strong growth in the coming years. Music production software, also popularly known as digital audio workshop (DAW), is a widely used software for digital recording, musical composition, creating electronic music, and other musical applications. Popular DAWs software are Cockos REAPER, Image-Line FL Studio, Logic Pro X, Pro Tools, Ableton Live, Steinberg Cubase, Propellerhead Reason and Bitwig Studio. With the increasing number of DJs and live programs across the world is primarily driving the demand for digital audio workstation and which is results into growth the market over the forecast period. Moreover increasing demand for digital audio recording from media and entertainment industry is expected to fuel the growth of the market over the forecast period. However, limited number of highly skilled and trained users is projected to inhibit the growth of the DAWs market across the world. The market for digital audio workstations is forecast to grow to US$ 1,486.0 Mn by 2026 from US$ 702.5 Mn in 2017, recording a CAGR of 8.8%. Based on component, the digital audio workstations market is segmented into software and services. In terms of revenue, under software segment, suite software segment accounted significant market share globally in 2017 and is projected to hold its leading position over the forecast period. Moreover, this segment is estimated to witness strong growth over the forecast period due to its huge user base in North America and in Europe region. On the other hand, operating and maintenance services segment is also estimated to witness significant growth over the forecast period after system integration services segment due to its increasing application in different end-use sectors. In terms of OS compatibility, the Mac OS segment accounted major share of the market and is estimated to maintain its leading position in the market over the forecast period. Increasing adoption of Mac OS in recording and editing digital audio files is expected to propel the demand over the forecast period. Mac provides a better all-round solution for many users, because of excellent build quality and the stability of Mac OS. On the basis of deployment, cloud is one of the most favored segment of digital audio workstations, and is evolving steadily due to increasing number of users in different end-use industries. Based on end-use sector, the global digital audio workstations market is categorized into commercial and non-commercial sector. In terms of revenue, under commercial segment, professional sector widely utilized DAWs software and services to record, edit and produce digital audio music files. Remarkable number of existing users across North America region, is anticipated to generate maximum revenue for the digital audio workstations market over the forecast period. Europe and South America is anticipated to follow the similar trend during 2018 – 2026. Further, Middle East & Africa is forecasted to witness significant CAGR growth after South America and APAC. Attracted by this steadily expanding market and underlying embryonic demand, many small and large enterprises are driven to invest in the market for digital audio workstations software and services. Right from system or software developers to integrators and professional services providers, across industries strengthening their position in the digital audio workstations market. Product innovation and upgrade of research and development are constantly taking place in the digital audio workstations market. For instance, in December 2014, Acoustica, Inc. released Mixcraft 7 and Mixcraft Pro Studio 7, after 2 years of research and development. Some of the prominent players as identified in the digital audio workstations market and profiled in the study include - Ableton AG, Acoustica, Inc., Avid Technology, Inc., Cakewalk, Inc., BandLab Technologies, Presonus Audio Electronics Inc., MAGIX Software GmbH, Steinberg GmbH, Adobe Systems, Inc., and Mark of the Unicorn among others. 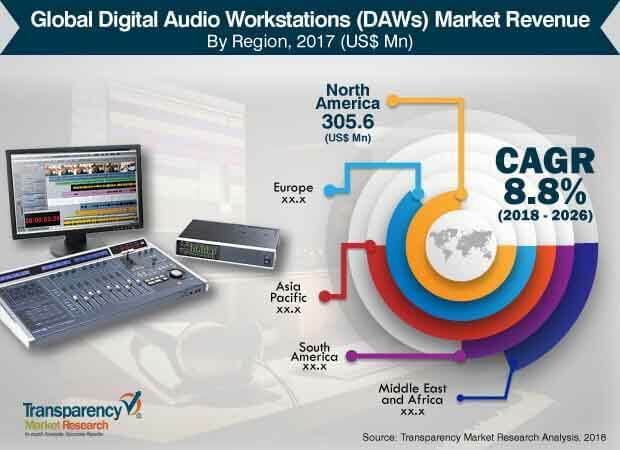 This comprehensive report by Transparency Market Research analyzes and provides growth forecast for the digital audio workstations (DAWs) market at the global and regional level which includes Asia Pacific, South America, North America, Middle East & Africa (MEA), and Europe. The report provides analysis for the period 2016–2026, wherein 2018 to 2026 is the forecast period and the base year is 2017. An in-depth and unbiased market assessment has been made to offer readers insightful and accurate analysis. The report emphasizes on all the major trends and services playing a key role in the growth of the digital audio workstations market over the period 2018 - 2026. It also focuses on the restraining factors, market drivers, and opportunities of the market during the said period.